To view the world exactly as it presents itself to the eye. Or to the senses. We often categorize things too soon, or have categorical sclerosis. For the west, the concept of Categories goes back to Aristotle. We refer to a "categorical error" we are talking about an inappropriate pigeon-holing, such as "the weight of Monday" or "the colour of sound." We often, if not always, miss what is actually there. Do you hear what you hear. 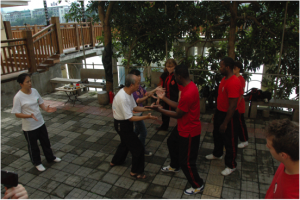 Budo challenges its students to experience everything with a clear mind.